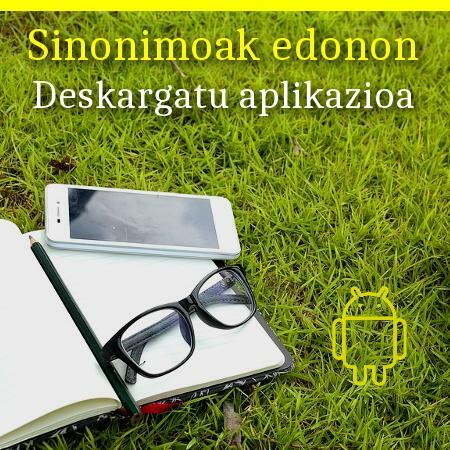 The UZEI dictionary of synonyms is a resource for enriching Basque vocabulary and allowing you to find the proper word in each context. [betaurrekoak] : betaurrekopl., largabista Ipar., luneta Ipar.pl., antiojo Heg. beh.pl., antipar Heg. g.e.pl. You can consult synonyms that a word has in each of its meanings, or in a specific dialect, or in different linguistic registers. The user decides the pertinence of each synonym, depending on the use they wish to give it. For example, choosing the form of one dialect or another will add a different nuance in each case. Thus, “emakumea” [woman] would be emaztekia in Lapurdian/Low Navarrese, and andrazko or andrakume in Biscayan. The result would not be the same either depending on whether the register is cultural or colloquial. A “hypocrite” would be azalutsa in an educated register, or simply faltsua at a more colloquial level. This dictionary is not a general dictionary, and therefore it does not include all the entries of a general dictionary. It only includes those with synonyms. The same happens with the different meanings: only meanings with synonyms are included in this dictionary. Consequently, the dictionary has 26,703 entries with synonyms, and a total of 30,628 meanings. This dictionary is constantly updated: there is no need to wait for the publication of new editions, because the information in its data base is updated on a daily basis.